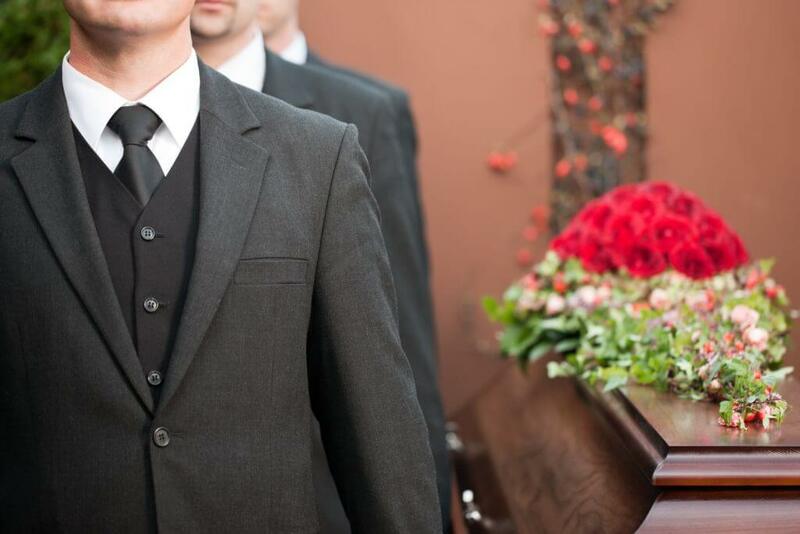 It is important to dress correctly when attending a funeral, but it can be difficult to know exactly what clothes are appropriate and which should be avoided, especially when grieving. The classic funeral attire for men is a black suit, black shoes and a black tie, accompanied with either a white or black solidly coloured dress shirt. However, it is also acceptable for men to wear a dark navy, dark brown or dark charcoal suit over a shirt to traditional funerals, provided that they look suitably muted and respectful. A waistcoat is optional. Lightly patterned suits in these colours are appropriate if they’re not ostentatious – houndstooth or herringbone are good choices, pinstripe less so. In the absence of a full suit, a suit jacket and smart dark dress trousers is also a respectable outfit choice. If the weather is bad, consider wearing a simple dark coat, ideally black. A traditional graveside funeral is not the time to wear waterproofs, so take a black umbrella with you in case of rain. Make sure that your shirt is tucked in and buttoned up fully, that your shoes are polished and that you are well-groomed in general. If it is a sunny day, take shades but make sure that they are understated. If you look smart enough to go to a job interview, you are smart enough for a funeral. However, unlike at a job interview your goal is not to draw attention to yourself and to appear sombre and respectful. Use your judgement. If you are attending a religious funeral and don’t belong to that faith yourself, it’s vital that you speak to the hosts to clarify what is appropriate to wear. There are some faiths that consider black an inappropriate colour for funeral dress. Wearing white is mandatory at a traditional Hindu funeral. White is also preferred by some Buddhists. Men at Jewish and Sikh funerals should also cover their heads and be prepared to remove their shoes before entering the place of worship. Modern funerals are often so personalised that it is hard to make absolute statements about what not to wear. Generally speaking however, there are definitely some things to avoid. Boldly patterned suits, shirts and ties are not appropriate for funerals. Nor are open-toed shoes and trainers of any kind. Exceptions should only be made if specifically requested on the funeral invite. Sometimes the deceased’s nearest and dearest ask mourners to wear bright or fun clothes – this is particularly common if the deceased is a child. If the funeral incorporates a woodland burial service, it is also more common to wear practical outdoor shoes instead of dress shoes. Ask the hosts if you’re unsure. Don’t drown yourself in aftershave or cologne. Apply them sparingly, but remember that funerals generally take place in an enclosed space such as a crematorium or chapel. The very last thing you want is to overwhelm everyone with your scent, which may prove distracting even if the funeral takes place in an outdoor location.